The Armenian massacres (1894-1896) in the Ottoman Empire during which around 300 000 Armenians were victimized found an echo in Germany and the German media. The Turkish authorities did their best for the German society to be ignorant of the perpetrated massacres and having the support of the German state and diplomatic circles for that purpose they granted the representatives of the German media with “rewards” to present only pro-Turkish and distorted false news or at least to keep silence. Nevertheless, already starting from the autumn of 1895 a series of German periodicals began to publish true news and articles on the massacres predominantly based on the American, Swiss, British and French media. On the basis of these true news about the Hamidian massacres a pro-Armenian humanitarian movement gradually started to form in Germany where the main actors were the ecclesiastical and public circles. They started to voice more actively the issue of the Armenian massacres in the Ottoman Empire, to give donations for helping the suffered Armenians, to carry out pro- Armenian-humanitarian advocacy campaign and try to enlarge the circle of their proponents. The significance of a series of German periodicals was enormous in those years which not only published news on the Armenian massacres but also made appeals to support the Armenians, carried out financial donations on their pages and made the topic of the Armenians alive. “The German Aid Society for Armenian Relief” (GASAR) was founded on July 2, 1896 which included the committees of Frankfurt and Berlin and some other subcommittees. Later the Frankfurt Committee of GASAR formed as German Aid Society for Christian Relief Work in the Orient (GASCRWO), today; “Christian Aid Society in the Orient”) becoming the legal successor of GASAR. Over time GASCRWO established five stations and numerous sub-stations in the Ottoman Empire. One of the main stations was established in Marash (in Cilicia, modern Kahramanmaraş in Turkey) based on the orphan care activities initiated already since October 1896 which over time turned into the second largest station among all of the German missionary stations both by its number of orphans and the staff. Anna Rubach, the first German employee, arrived in town in January 1898 and started to manage the station. During the years of the Ottoman Empire the German mission operated for more than two decades, till September 1919 when by the demand of Great Britain and France, as the subjects of the defeated party in the World War I, it was forced to quit Marash leaving here only one employee, Marie Timm. The station was transferred to the American mission. GASCRWO resumes its missionary activities in the republican Turkey, but this time in more limited scope. It has also been functioning here in 1930s. At the beginning the German mission had a goal as far as possible to help the Armenian population which had been the victim of the Hamidian massacres and more or less alleviate the present need. Over time different areas of activity started to emerge – providing care for the orphans and widows, education, teaching crafts, medical-caregiver work in hospitals, work with poor and needy, evangelisation. Orphan care was the most important sphere of the German activity in Marash. GASAR, and then also GASCRWO, adopted the “system” of foster parents when one person, a married couple or an organisation undertook the responsibility of taking care for one or children by paying 150 (later 180) marks for each child annually. There were cases when several people jointly took the custody of the child. Later the child and the foster parents were often engaged in correspondence and in separate cases the Armenian orphans, when being in Europe, visited their foster parents who had paid money for their care for years. At the beginning of orphan care work “only” several dozens of children were taken care of in Marash, whereas in 1919 their number grew nearly one thousand. During more than two decades hundreds or even thousands of children were rescued and taken care of in orphanages. One of the advantages of the German orphanages was that all children received primary education. Armenian language, Turkish in Armenian script and Ottoman Turkish as well as other subjects were taught in the first three grades, later on also English, history, geography, etc. After the Young Turk Revolution classes of physical training were allowed here, the teaching of German was promoted as well. Over time the station also formed high schools. 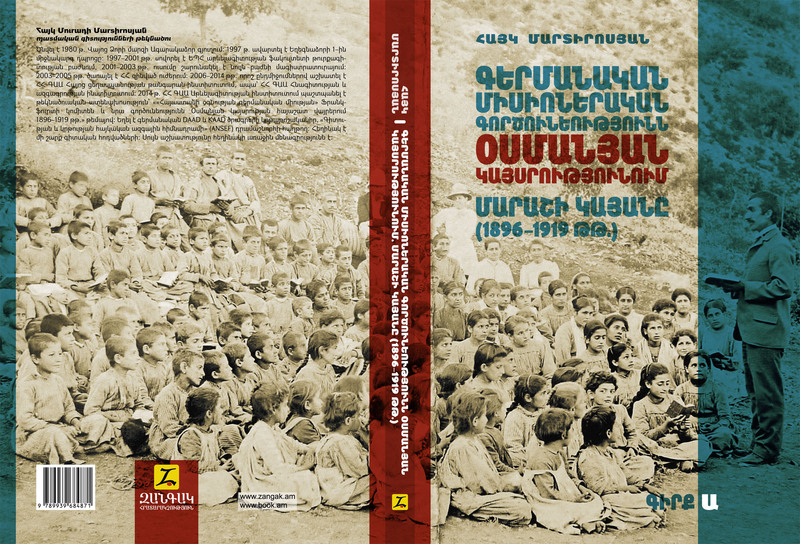 On the eve of the World War I 310 pupils of the station as well as other children from the city studied here under the supervision of 17 Armenian and European teachers. Besides, there operated an evening school, where orphans learnt crafts. To replenish the lack of female teachers some of the pupils were trained in the station or at the local college of the American mission, in rare cases in Germany. By the means of GASCRWO there were also schools operating out of Marash in Zeytun, Kharaghach, Demrekh, while in many other villages education was organised by male and female preachers. Due to all these thousands of children in Marash and its surrounding areas became literate, learnt Armenian and other languages, besides the teaching level of Armenian improved. Taking into consideration the circumstance that some villages were also Turkish speaking and the Turkish in the Armenian script was widespread in the region, the education of these children was more highlighted. During the years of Genocide good knowledge of the German was a serious prerequisite for those who had left the station to stay alive and find a job. All the children of older age learned any of the crafts which helped them to earn for their living after becoming an adult and leaving the station. For that purpose workshops of textile manufacturing, blacksmithing, joinery, Oriental and European shoe-making, embroidery and other crafts operated within the station. The manufactured items served the orphanage children or were sold in cities, in some cases even in Germany. Widow care was also one of the spheres of the station activities, though the number of widows was not very large and reached about 63. The point was that it was difficult to fundraise money for widow care in Germany and money was mainly given for orphan care or other purposes. 80 marks were provided for the care of each widow. Meantime care work for the poor and the needy was realised, domestic animals, grain, cotton were bought for village population and free canteens were organised for them especially during winter months. Medical-caregiver works in hospitals were also very important and were warmly appreciated by all people, including the Muslims. Over time doctors from Europe worked here, among them German Dr. F. Härle and Dr. R. Müllerleile, Swiss Dr. J. Fallscheer-Zürcher (the first doctress in the Ottoman Empire), nurses and hospital attendants P. Schäfer, I. Meincke, E. Elvers, J. Schalk, K. Jorken and many others. “Salem” hospital was founded over time where serious surgeries were done. Trachoma (Egyptian ophthalmia), an eye disease, considered to be incurable before, already became curable here by the efforts of the Germans. Besides, classes for hospital attendants and midwives were organised under the auspices of “Salem” as there was a high demand for that both in Marash and its surrounding places. There were also Armenian doctors and hospital attendants working at the hospital and clinic. Several hundreds of surgeries were realised here annually and the number of admissions exceeded few thousands annually. The evangelisation was a more problematic area. The Armenian Apostolic Church actively struggled against various confessions as in the result of their activities amount of Armenians left the Apostolic Church causing disagreements and divisions among Armenians. If at the initial period the mandate was only about helping the Armenians suffered from the massacres, then along with the enlargement of the work there arose performances towards evangelisation which were strengthened over time and in 1913 with the leadership of A. Rohner Women’s Bible School was founded in Marash aimed at preparing women preachers for the surrounding areas. The school operated till the death of the founder and the exile of the Germans in 1919. Over years male and female preachers worked in many neighbouring places, such as Demrekh, Kharaghach, Kokison, Churukkoz, Zeytun, Yarpuz, Frnuz, Aregin, Mets Gyugh (Yenijekale), Fyndyjak, Vanki Gyugh (Fenk), Jamustul and elsewhere. During and after the days of the Armenian massacres in Cilicia in April, 1909, numerous sufferers were taken to “Salem” hospital of the station, expeditions were organised with the participation of P. Schäfer, R. Müllerleile, J. Schalk and others which visited the regions suffered from the massacres at most, provided assistance, medicine and food to the population on-site, realised surgeries. Besides, they rescued and took 300 orphans and several widows to the station with them (even from Turkish harems). The station of Harunie was founded on the basis of the Marash station in 1910 with the efforts of the latter’s employees. With the leadership of Beatrice Rohner, an employee of Marash station, and after the intervention of German officers and diplomats, orphanages were established in Aleppo in December, 1915 where Beatrice could give shelter to hundreds of orphans and widows who reached Aleppo and its neighbouring settlements. After the death of reverend Eskijyan in March, 1916, Beatrice Rohner undertook the governance of the underground network created by him through which it became possible to send large sums of money to the camps of the deportees in deserts with the help of messengers dressed in Bedouin clothes. Due to working at the orphanage numerous Armenian families were also saved. In 1917 by the order of Talaat Pasha the orphans were taken away from Beatrice and sent to Turkish orphanages. However, all those children were taken back from the Turkish orphanages later. It was also with the intervention of W. Rößler, the German consul in Aleppo, the orphans in Marash station kept safe from exile and destruction. Moreover, many Armenians before exile, in case of an opportunity, left their children or one or two of them at the station, with the condition of taking them back upon return, thus saving their lives from possible death. In rare cases parents returned and took their children back. But often no news would be received about them. After 1918 the station was also engaged in rescuing Armenians from Muslim houses and supporting the returned Armenians as much as possible. About one thousand children were rescued by the station during those years. In 1919 the station passed under the US leadership but the difficulties still existed. 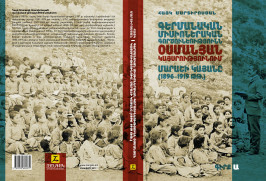 During the retreat of the French troops at the beginning of 1920 the orphans and the staff of “Bethel” girls’ orphanage left the city together with the “Armenian legion” and thousands of Armenians, while the children and the staff of the “Bethshalum” boys’ orphanage (according to different sources up to 526-600 children), including Marie Timm, as well as 3000-5000 Armenian deportees taken refuge in the orphanage, stayed till the end and were saved. Several dozens of missionaries worked in Marash from Germany, Switzerland, Scandinavian countries and Estonia from 1898-1919. Some of them worked here for many years, others about two decades, and the rest for a short period of time – only several months. Their work was not often comfortable and safe. Turkish authorities created a lot of obstacles for them, persecuted them, made Zeytun sub- station to be closed, and F. Brockes, who had delivered a speech here, was exiled from the country by the tacit agreement with the German authorities. P. Schäfer was threatened to be killed during his visits to the most suffered areas in 1909, and H. Stockmann was attacked on his way back from Aleppo to Marash. However, there were also losses among missionaries: C. Eckert, M. Rohner, K. Blank and A. Rohner died and were buried in Marash. This book presents not only the history of the Marash station of GASCRWO but also the life and activities of 40 German, Swiss and Scandinavian missioners, separately given in encyclopaedic format, among them Lina Blank, Karl Blank, Jobst Heinrich von Bülov, Gertrud Brunnemann, Richard Brunnemann, Magdalene Didszun, Pauline Seide, Hedwig Seidler, Eva Elvers, Christine Eckert, Gabriele Härle, Friedrich Härle, Adele Herold, Anna von Hochstetter, Ina Meincke, Luise Müllerleile, R. Müllerleile, Käthe Jorken, Paula Schäfer, Hedwig Schalk, Johannes Schalk, Ella Schmidt, Martha Schneider, Marie Spiecker, Wilhelm Spiecker, Helene Stockmann, Olga Schröder, Gustav Palentinat, Emma Palentinat, Klara Pfeiffer, Anni Rohner, Beatrice Rohner, Maria Magdalena Rohner, Anna Rubach, Auguste Skarnikat, Thora von Wedel-Jarlsberg, Marie Timm, Adolf Zeller, Gemahlin Zeller, Josephine Fallscheer-Zürcher. Most of them are eyewitnesses to the 1909 Cilician massacres and the Armenian Genocide who remain unknown up now though. There is a necessity to do a separate and deeper research on many of them. P. Schäfer and B. Rohner voluntarily passed a long way with the deportees’ caravans to be able to help the Armenians, collected orphans from the roads and brought to the station, bore physical and spiritual hardships, lost people whom they cherished during their work. This book is an attempt to reveal their unknown names and grateful work, which cost them their health, and in some cases lives. In contrast with the German state- diplomatic circles these people and their proponents cared about the sufferings of their Christian brothers who were the victims of the Ottoman Turkish authorities and did their best to help Armenians. Hayk Martirosyan was born in Agarakadzor village of Vayots Dzor region on June 14, 1980. In 1997 he graduated from N1 secondary school of Eghegnadzor. In 1997-2001 he studied at the Department of Turkish Studies of the Faculty of Oriental Studies of Yerevan State University, and then in 2001-2003 he continued his study at the Master’s school of the same faculty. In 2003-2005 he served in the armed forces of the Republic of Armenia. From 2006-2014 with some intervals he worked at the Comparative Genocide Studies Department of the Armenian Genocide Museum-Institute of the National Academy of Sciences of the Republic of Armenia as a researcher then at the Modernity and Ethnology Department of the Institute of Archeology and Ethnography. In 2014 he defended his Ph.D. thesis at the Institute of Oriental Studies of the National Academy of Sciences titled with “Frankfurt Commitee of the German Aid Society for Armenian Relief and its Activities in the Armenian populated Territories of the Ottoman Empire (1896-1919)”. In 2014-2015 and 2011-2012 he conducted his research at Friedrich-Alexander University in Erlangen-Nuremberg, Germany, as well as innumerous archives. Hayk Martirosyan is also a grant winner of German DAAD and KAAD scholarship programs, “Armenian National Science and Education Fund” (ANSEF). He is the author of several scientific articles, has participated in various international conferences. Hayk Martirosyan is also a co-translator of Jacob Künzler’s book of “In the Country of Blood and Tears. Experiences in Mesopotamia during World War (1914-1918)” (German: “Im Lande des Blutes und der Trähnen. Erlebnisse in Mesopotamien wähhrend des Weltkrieges (1914-1918)” from German into Armenian. “German Missionary Activity in the Ottoman Empire: Marash Station (1896-1919)” is the author’s first monograph which is created predominantly on the basis of archive sources thus for the first time the author putsmany valuable sourcesinto scientific circulation. Besides native Armenian, Hayk Martirosyan masters German, Turkishand Russian, has also a good knowledge of English.